Last year I wrote the following article for the British Aikido Association magazine “Shizentai”. The intended audience is mainly Tomiki Kenji lineage aikido folk. I very much like the name Shizentai, as “natural posture” is generally what we use in our practice. “Just like Aikido, but just performed harder or more brutally”. “Just like Aikido, but with lots of added striking”. These statements are not entirely without merit as of course, Daitō-ryū could indeed be performed this way. But this is more likely to be interpretation at club, school or personal level in exactly the same way Aikido is subject to. However, the statements are inaccurate and often lead to the assumption that “doing aikido harder” or “adding some atemi” turns Aikido into Daitō-ryū. This could not be further from the truth. For a prime example of this misconception, search YouTube for “The difference between Aikido and Aikijutsu” (sic). Looked at in reverse, it would be similar to saying “Aikido is just Daitō-ryū done softly, and with a lot less techniques”. The inaccuracy of this statement is apparent immediately. So how does one define Daitō-ryū? These three simple distinctions are important, and understanding what they mean is key to understanding the basic tenets of Daitō-ryū. This is a very simplistic overview of Daito-Ryu. 1. Jujutsu is the waza. The well known DVDs from Kondo Katsuyuki (Mainline Daitō-ryū Branch) produced for public consumption are primarily Jujutsu forms. In practising all forms of Aikido, everyone is exposed to Jujutsu. When we practise Randori-no-kata or the Koryu-no-kata we are generally doing Jujutsu. 2. Aiki-no-jutsu is a method very specific to Daitō-ryū. It is hiden, the secret highly effective soft stuff you may or may not get taught. 3. Aiki-jujutsu is the end product. The result of employing the skills from Aiki-no-jutsu, in order to perform Jujutsu waza. Now what significance does Daitō-ryū have for Tomiki Aikido? Tomiki Kenji began studying Daitō-ryū Aiki-jūjutsu with Ueshiba Morihei in 1926, and was awarded 8th Dan in 1940. Ueshiba Morihei’s official association with Daitō-ryū continued right up until 1937. After Ueshiba broke away from Takeda Sokaku, he used “Aiki Budō” as one of the names for his new style before finally settling on “Aikido” in 1942. So Tomiki Kenji learned Daitō-ryū from Ueshiba Morihei. In 1933, Ueshiba published the manual “Budo Renshu”, which was compiled by Tomiki Kenji. The Tomiki Aikido Koryu dai ichi contains much of the waza from Budo Renshu. In 1954 Tomiki Kenji published “Judo Taiso – a method of training Aiki-no-jutsu through Judo principles”. The link back to Daitō-ryū Aiki-jūjutsu is clear. The physical principles that support Daitō-ryū are the very same that Aikido (of all styles) was built upon. So Daitō-ryū has much to offer students of Aikido in terms of history, and technical repertoire. In the same way Aikido styles and schools differ, Daitō-ryū branches differ. The large syllabus of waza remains across most branches, but how they operate is frequently different. Where one branch may concentrate on Jujutsu, another may focus on Aiki-no-jutsu. Just like with Aikido, what students experience at one school is likely to vary wildly from those at another. Daitō-ryū has traditionally been very conservative when it comes to what is taught, with schools often refusing to perform public demos, or to show anything to outsiders. Takeda Sōkaku spent over 50 years of his life teaching Daitō-ryū. He kept meticulous records of everyone who learned anything from him. His record book (eimeiroku) covers 45 years of his teaching career and contains 30,000 names. It is said that Takeda Sōkaku would not teach the same technique twice for fear of it being “stolen”. We have also heard from multiple sources, the assertion from Takeda that the “real techniques” should only be taught to one student in a thousand. The first Daitō-ryū teacher to openly teach Aiki-no-jutsu at open seminars was Okamoto Seigō. Okamoto Sensei was the top student of Kōdō Horikawa, the longest serving student of Takeda Sōkaku. Okamoto Seigō passed away in 2015, just before what would have been his 90th Birthday. Howard Popkin and Joe Brogna are based in Long Island, New York, USA. They strive to continue the legacy of their teacher Okamoto Sensei. 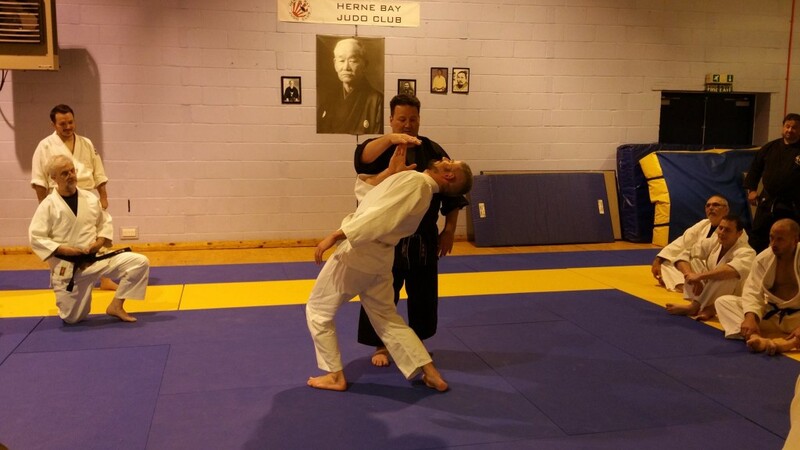 They will be in the UK teaching Daitō-ryū Aiki-jūjutsu at the Aiki Connections 2018 event on June 30th and July 1st at Genryukan Aikido Club in Dover, Kent. “I highly recommend taking an opportunity to challenge your own skills and grow your own Aikido by attending a Popkin & Brogna seminar!” – Bob King (6th Dan TAA) Chief Technical Director, Tomiki Aikido of the Americas.